This story sheds light on one of many DDoS as a service tools that rapidly gain popularity over the last few years. VDoS is not the only attack-for-hire service out there. Many of the world’s most notorious hackers have developed their own iteration of a for-hire attack website. Many have learned how to avoid prosecution with extensive Terms of Service agreements that absolve them of personal liability. And as we can see from the VDoS founders, DDoS-as-a-Service (DDoSaaS) is a profitable business! Radware’s ERT researcher, Daniel Smith, talks at length about the breadth and sophistication of for-hire attack services in his Rise of Booters and Stressers blog. In addition, this raises a flag for organizations around the globe. 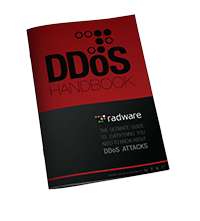 Companies must rethink DDoS protection strategies in a world where such tools commoditize attacks, site owners can make so much money so quickly, and the model for calculating return on investments of security protection technologies is reset. How to look at this? The time has come to find the vendors who can support real time detection with high quality (e.g. not requiring source or destination IP address) blocking. Also, this must be done while negotiating SSL and encoding algorithms. Best of luck, and always know that Radware can help! Nice article.May I know currently unsolved DOS/DDOS attacks(like amplification or reflection like DNS,HTTP etc.) and some of the areas? Will Mirai botnet DDOS attack will come under which category? Is it like reflection based or kind of Smurf attack using IoT devices?